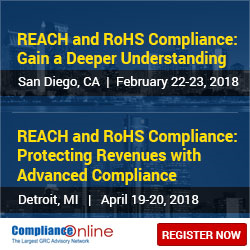 ComplianceOnline, the leading GRC advisory network, and industry expert, Kelly Eisenhardt, will conduct two seminars on REACH and RoHS Compliance. This seminars will review the basic fundamentals of each regulation and provide a step by step process for building internal compliance programs. ComplianceOnline announced seminars on REACH and RoHS Compliance. These seminars led by industry expert Kelly Eisenhardt, will be held on February 22-23, 2018 in San Diego, CA and April 19-20, 2018 in Detroit, MI. This 2-day seminar will go into the specifics of the REACH and RoHS regulations, provide case studies and share lessons learned so your organization can benefit from the mistakes of others. We will review the latest on both directives and will draw out key developments and key dates (if applicable) with particular emphasis on requirements for US firms. Seminar Instructor Kelly Eisenhardt has 20 years’ experience in IT and Compliance Software Development, her former roles include: Executive Director of Environmental Programs, at Fair Factories Clearinghouse; Environmental Compliance Manager and Design for Environment programs at EMC Corporation; and Director of Product Management at PTC Corporation for Windchill Product Analytics – an environmental compliance software. These seminars will provide valuable assistance to all personnel in automotive, electronics, medical devices, chemical, toys, industrial machinery, and manufacturing professionals. Anyone responsible for RoHS and REACH compliance and anyone new to RoHS or need to understand the regulations will be benefited by these seminars.